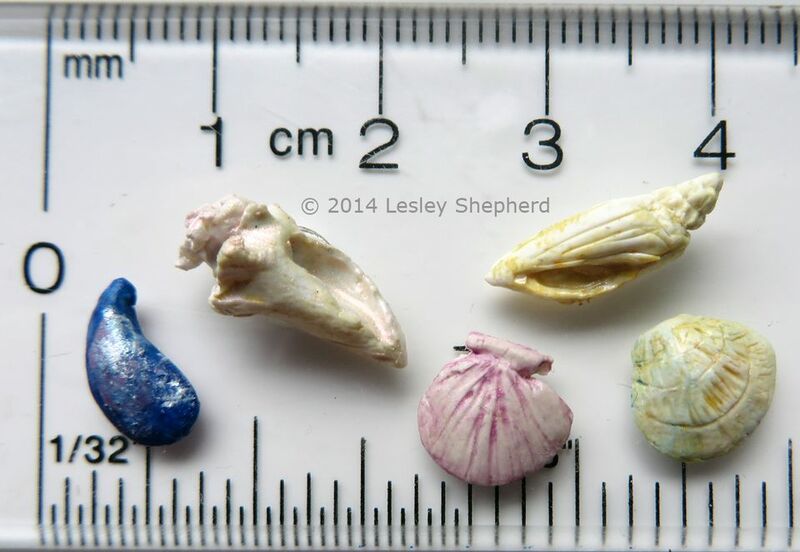 While you can collect many shells in tiny sizes, if you live far from the sea or are concerned about the collection of real shells, you can make realistic shells for miniature and dollhouse projects using polymer clay. The shells don't take very much time to make, and you can make them in sizes to decorate miniature driftwood wreaths, mermaids mirrors, or other beach or sea themed projects. They work well with the miniature seaweed and can be used for specialized projects like decorating dollhouse miniature cupcakes or wedding cakes. There are 3D nail art shell molds available to make miniature shells. These can be used with a ​variety of materials, including polymer clay if a resist layer is used. The shapes and sizes are limited but often useful for standard dollhouse miniatures. Practice safe handling of the clay and use tools which are used only for modeling or working with craft materials (not food materials). To make the miniature seashells you will need white and transparent polymer clay, as well as paints and finishes to add color to the finished shells. You may also need a bit of waste clay to shape a shell form for hinged shells. You can use watercolor and acrylic paints mixed with acrylic varnish and matte varnish to detail the finished shells. The tools used to shape the shells include clay cleaning tools, ball ended embossing tools, and a fine beading needle or pin. You will also need a tinfoil pan or tile to bake your miniature shells. You may want some baking soda on the pan to prevent the clay from glazing where it touches the smooth baking surface. If you use a shell form to help you shape your shells, you will need a resist; cornstarch or talcum powder, to prevent your clay from sticking to the form. If you prefer, you can also make the shells from air dry clay. To make miniature seashells from polymer clay, use a blend of roughly 4 parts white to 1 part translucent (porcelain) clay. The translucent helps to make the white clay easier to shape and also allows you to thin the clay out at the shell lips if you wish. You can add pearl ​ex-powders to the clay to color it if you want to make shells which have a deeper color (mussel shells for example). For shells which are basically white with lines of color, it is easier to apply color to the details after the polymer clay has cured. If you want to make a range of hinged or 'bivalve' shells like oysters, mussels, clams, it is easiest to first make a form to shape the clay over. The same form can be used to shape most bivalve shells. You can make the form from waste green clay, by rolling out a teardrop shape and curving it slightly to one side. The narrow end of the shape should be slightly lower than the area immediately adjacent to it where the form widens. The lowest end of the shape should be at the widest end of the shell. The purple clay shown next to the form is a smaller version of the preliminary shape made for the form. It is a blend of polymer clay and pearl ex-powder which will be used to make a miniature mussel shell. When you have your basic shell form shaped as shown. Cure it by baking it at the correct temperature in an oven and allow it to cool. Once you have the shell roughly shaped on the form, trim the outer edges and carefully remove the shell shape taking care not to flatten it. Use a round ended pin or a ball ended embossing tool to press the narrow edges gently down on either side of the point where the shell would hinge. Detail your shell, (see next step) then bake according to your clay directions, placing the shell on a layer of baking soda to prevent it from glazing on the baking surface. When the shells have cooled, use fine sandpaper to smooth the edges of the shells if necessary. Miniature scallop, mussel, and oyster shells can also be shaped on your basic shell form. Roll out a thin pancake of polymer clay on a flat surface. Use a pin or clay shaping tool to trim the distinctive flat hinged end of the scallop shell as shown (or refer to a photo of an actual scallop shell). The shell will layer be detailed with radiating lines leading from the hinged end. Once you have the rough outline of your scallop, lift the shell shape carefully from your work surface (a polymer clay blade works well) and set it so the shell can be slightly rounded over the shell form (which has first been dusted with talcum or cornstarch). Scallop shells are only gently rounded and many are almost flat. Add details to the scallop shell while it is on the form (to preserve the rounded shape) then carefully remove the scallop shell and set it on your baking surface. Bake, then sand the edges if necessary. The miniature mussel shells are made by taking a small cone of clay, then flattening it and rounding it slightly on both ends. The clay is then set over the basic shell form (first coated with talcum or cornstarch) as shown. Press the clay over the form to shape it, keeping the shell narrow and deep on the hinged end, broader and shallower at the opening end. Most mussel shells are smooth. Details can be added easily with paint after the shell has been baked and cooled. Here you can see some basic miniature shell shapes ready for final detailing. Take care when smoothing out the clay or adding finishing details that you keep the slightly hollow curved shape of your miniature shells. If necessary, you can set the shell back on the form to finish adding finer details, just dust the form with talcum or cornstarch before setting the shell back on the form. The final step in making any miniature shell is to add the distinctive growth lines to the shell surface. All bivalve shells add on to the wide end of each year's growth. If possible look at some real examples of the shell you are modeling to see the main lines and ridges of the shell. Use a fine pin or beading needle to add lines and ridges, as well as the growth rings to your shells. Take care not to make the lines too straight, try to gently curve them along the shape of the shell for the best effect. For some fine details, you may want to use a paintbrush to gently shape the surface of the shell. Stiff paintbrushes can be used to add fine lines, experiment to see how your brush affects the surface texture of the clay. Gastropod (snail) shells are the spiraling form of sea shell which has no hinge. 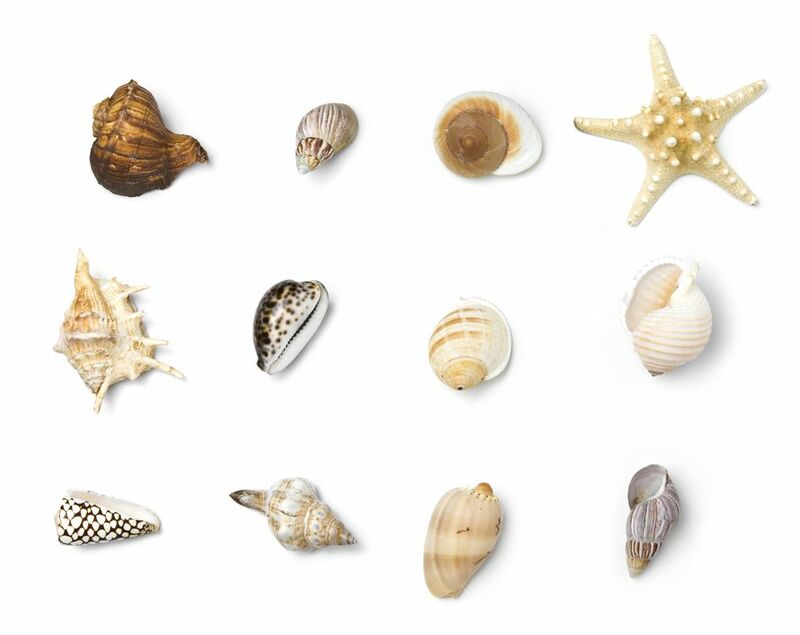 There is a wide range of these shells in many colors shapes and sizes. They are easiest to make by making them in two parts. The main opening section of the shell (shown here as a narrow cylinder for this particular shell) is made as a general shape, then the narrowing spiral is added to the wide end of the cylinder. The spiral is made from a narrow roll of clay, which is slightly wider on one end. Begin the spiral at the narrow end taking care to wide the spiral as you make it larger. You can use an embossing tool to carefully blend the edges of the spiral together on the inside of the shell if necessary. Fit the finished spiral to the wide end of the main shell body. Use a modeling or embossing tool or brush to blend the join of the spiral to the main shell. Once the sections are joined together, the opening can be cut into the main shell and shaped according to the type of shell you are modeling. Fine detail lines can be added with a beading needle or pin. Once you have the shape completed and the main details in place, set the shell on a bed of baking soda on your baking surface and bake according to your clay requirements (or allow air dry clay to dry). After the shells are hard, you can add final painted details to highlight the shape of the shell, or add the distinctive colors to the shell. Conch shells, as well as some whelk shells, have interesting spines or protuberances which are very distinctive. To recreate these for miniature shells it is easiest to begin with the basic roll for the upper spiral and the main shell cylinder as you did for other spiral shells. Before you attach the two parts of the shell together, use an embossing tool or another modeling tool to shape the edge of the clay roll (see photo). This shaped roll is laid into a small spiral, keeping the rough edge facing outward. The top of the main shell can then be detailed with modeling tools after the spiral is attached, to make the shell horns. See photos of real conch shells to make your shell as realistic as possible. As with the other spiral shells, once you have the main shell shape, make the opening and the lip in the shell using modeling tools and or embossing tools to create the rounded edges. Bake your shells and allow to cool (or dry) then use matte or gloss acrylic varnish and paint to add color or sheen/ gloss to your shell exterior. For some shells, you may need to paint distinctive markings on the inner lip or outside sections of the shell. Older 'weathered' shells may be made without any sheen and muted colors to make it look like they have aged naturally on a beach. Have fun making a range of shells. You can set them in a miniature collectors box for a Victorian naturalist's room, frame them for wall art for modern collections, or use them for a beach themed decorations for your miniature scenes.